It took Roka about fifteen minutes to trek back to the farm. Rushing through the blue wavering haze of the afterlife, he looked around and saw the village bathed in a different light. He followed the friendly blue arrow towards the chapel until he was, for a moment, unsure if he had found the correct destination. He had expected to find a tall brick structure, bathed in holy light. Instead, he found a small shack with an apothecary's sigil pained in blue on the outside wall. "Hello" said the Buddha fox. "You appear to be dead. Would you like a hand with that?" The canine wondered if this was the same Buddha fox, or if it was just a distant relation to the previous one. "Yes" he answered, eagerly. With a wave of its paws, the Buddha fox bathed Roka in a fiery golden light. Roka looked up, eyes widening as the blue haze that had seemed to saturate the world faded, giving way to the vibrant colours of the farm once more. He looked up at his health bar, and was amazed to see that it was fully restored. With a quick tug, the cleric pulled a small booklet from his backpack. His guide to the game’s universe, his booklet expanded before him, opening into a large menu that filled most of Roka’s view. Within a few moments, he had searched through its pages, until he had located the details he was seeking. “Dying” said the book “is not the end of your adventure. When your character’s health reaches zero, he passes into the realm of the dead. Fear not, eager adventurers, for the realm of the dead is watched over by the Pikoli, a race of magical healers who will aid you in your return to the mortal world.” An image appeared, displaying a friendly-looking Buddha fox. “The Pikoli will offer to resurrect you, but their services come at a price. Be warned, though, that your journey into the lands of the dead will have an effect on the durability of your armour and weapons…” Roka closed the book, growing a little bored. The page continued on, and he didn’t want to spend his time reading. He was eager to return to his adventuring. Turning, Roka hurried into the village. The priest came to a halt outside the tavern. Even though Homestead Farm was the starting area, and generally safe from any major enemy attacks, it still boasted a decent-sized local tavern. Somehow, Roka felt drawn to it, as did many players, perhaps due to its placement near the heart of the village. Or perhaps, Roka thought, the developers simply knew that any fantasy village needed a tavern by law of genre trope. Resting for a moment, Roka quickly glanced over his possessions, checking that everything had made it back from his inexplicable trip into the land of the dead intact. Relieved that his collection of rocks, scraps of paper and foul cheese was unharmed, the cleric glanced at his experience points. He felt a sinking feeling. The numbers looked depressingly low. He still had a long, long way to go before he would reach fifth level. "It's no use" said a nearby voice, "we're just not strong enough." The dog turned to glance in the direction of the voice. He peered into the tavern. It was lively inside, populated by non-player characters who busied themselves in a continual, never-ending cycle of pouring pints of ale and sweeping the already clean floor. In one corner, Sven the farmhand sat, asking any nearby adventurers who approached him to find his lost sheep. Beside the bar, however, Roka noticed two other players, just like himself. It had taken him a while to figure out the difference between the two. When he had first visited the tavern, he had watched the bartender, observing him as he polished the same ale stein for ten full minutes before Roka was convinced that he was not in fact a real person. The two sitting at the bar, though, were definitely real. "It's not just a regular monster" said the first figure. He was short, stocky, thickly built. Roka guessed, from the figure's thickly built stature, stubby horns and bushy red beard that had been pulled into thick braids that he was a buffalo. "It's a vampire!" The other figure was taller, but not by much. The tips of her rabbit-like ears brought her skinny form up to almost chest-height with the feline bartender. A short puff-like tail flicked animatedly behind her. The cleric was certain that he had seen her species before, listed back on the character creation screen. He had played with it for a while, considering if it would suit him as an avatar, but had ultimately decided against it. For the life of him, Roka couldn't remember what they were called. "The chance of the vampire using his 'blood drain' ability is only thirty per cent," said the woman, "but it increasers to sixty per cent once he is down to half his hit points. It then increases to eighty per cent at a quarter health points remaining. The odds are definitely against us." Roka dared a glance closer. The two adventurers were heavily in mid conversation. He stepped a little bit closer, his curiosity starting to urge him onwards. The buffalo didn't seem to notice him. "Could I use a healing potion to get through it?" asked the buffalo. Roka looked for the bBuffalo’s name. In the game, the character’s names hung in bright, warm green coloured text above the character’s heads, signifying the person’s identity to all who wished to know. The buffalo, as a player, was no different. His name was Gunnar. There was a short delay, and then the rabbit-eared woman replied, "Not anymore.” Roka took a glance above her head as well, finding her name to be Exra. “In the beta test of the game, you could drink healing potions during a combat, but they removed that in the final release. The developers said that it made the fights unbalanced." Another player, a badger, hurried into the tavern. Completely ignoring Roka, the buffalo and the rabbit-woman, he hurried towards the bar. The bartender quickly pleaded with the badger to help him quell a swarm of rats that had invaded the basement of the building. Roka had already completed this quest, slaying ten large rats, only for them to reappear a few minutes earlier for another player to take their turn. The badger, without a word, hurried away towards the basement to slay his quota of the infinitely reappearing rats, sword in paw. "Only one thing for it then," said the buffalo, "we need a healer." Roka looked up. He wanted to say something. The impulse to speak rose up inside him. A healer? He was a healer. In fact, the cleric class was supposedly the best healer in the game. But then, he thought about the lizard. "Crap healer" he'd said, "Learn to play". Truth was that the canine really had no idea how to play the game. When he had installed it, he had thumbed through the instruction manual, skimming through the play guide. It had outlined the first five levels of playing a cleric, explaining that he would start off as physically weak but that his skills would soon grow rapidly. But there was so much about the game that he didn't know. It felt intimidating, scary even. Maybe the lizard was right, maybe he was no use. Maybe he should play a different type of character, he thought, perhaps he’d suit an archer type of class better. He swallowed. But then, the mission that the two people were discussing sounded fun. A vampire sounded scary, definitely a monster that he couldn't manage on his own. But it brought to mind a whole slew of images. What would the vampire look like? Did it live in a castle? If they killed it, would they be famous? Roka smiled. How dangerous could it be? Besides, all he would have to do was keep the other two alive. As long as they didn't stand in any fire, they should be fine. He wondered if the vampire might breathe fire. Somehow it seemed unlikely. He inhaled. “I’m a healer” he announced. The two looked over. Gunnar peered at him, his narrow eyes like small pinpricks over the bushy shrubbery of his beard. The rabbit woman's tail flicked to and fro, and without warning she began to jump up and down on the spot. "Aye, you're a cleric, laddie" said the Buffalo, "I hear they make fine healers." Exra nodded. "It will be tight at your level, but with your current skills for a cleric class of your level, we should be able to stand a chance if we’re careful. Hang on, I'm reading the description of the quest on my other monitor." She stared off into the distance silently for a moment, all the while jumping up and down, and then added "Have you done this quest before?" Roka shook his head. "I just started today" he explained, "I just got back from a cave with an ogre in it." "Whoa there laddie" said Gunnar, "which cave be that?" Roka shrugged. "It was full of spiders" he explained. "I got a little bored running around the village, so I ran off to the hills over to the east. That was where I ran into a lizard and some of his friends; they asked if I could heal them while they explored the cave." He looked down a little, "But we got killed by the ogre." The buffalo's eyes widened. "By Throm's beard, lad!" he explained. "That was Spiderwick Cavern!" "It's no wonder that you died" explained the rabbit woman, "that's a level eight dungeon. You must be a pretty good healer to make it all the way to the boss." Roka looked down. He didn't know about that. He didn't feel as if he was anything special, that was for certain. If anything, his encounter with the lizard had left him feeling unsure. Was healing even a talent he wanted to pursue? He wasn't sure. Quietly, Roka nodded. "I guess I can give it a try" he answered. "After all, what's the worst that can happen?" "That's the spirit!" said Exra. "If you don't already have the quest, we can pick it up on the way from the old washerwoman." Roka found the washerwoman in the garden, a small and leisurely area located barely to the south of the tavern, just past the blacksmiths. Upon arriving, the canine looked around, glancing at the soft babbling pool of crisp water that lay comfortably between two large decorate boulders. As they walked, the rabbit woman jumping to and fro excitedly. "Did you know that in the beta of the game, this area was a faerie glen? They changed it when they removed the faeries as a playable race." The dog raised his eyebrows, impressed. "You were in the beta?" he asked. The beta test of the game had been a secretive affair, allowing only a few players from around the world to have the chance to play the game far before it was released to the general public. Most of the beta players remained in the game through to the present day, their knowledge of the game's most secret pre-release development becoming a prized commodity. "Aye" said the buffalo, "my companion is one of those who dwelled here from the ancient times. I myself have only recently begun my travels, as have you my cleric friend." Roka gave Exra an uncertain look. "Is he okay?" She smiled. "Don't mind him. He just likes to role-play a whole lot." The cleric shrugged. It was not long before they met the washerwoman, an aged and very generic-looking character who provided Roka with his quest. She sat, perched cross legged atop a boulder at the corner of the garden. Every few minutes she would reach into a small hamper of clothing that sat beside her, pulling free what appeared to be the same blue dress each time, and began to wring it dry. Upon catching sight of the adventurers, she waved. "Oh, help!" she cried, "Won't you help me, brave heroes?" "How does she know that we are brave heroes?" asked Roka. "Shh," said the rabbit, "it's just a cut-scene." Without any further prompting, the washerwoman hopped down from her boulder and began to weep in a most animated manner, cupping her paws to her face and shaking terribly. "Won't you help me? A terrible darkness has befallen this sleepy hamlet. A great evil plagues this land, stalking the night! Oh, woe! Woe indeed!" Roka could barely restrain a chuckle. The rabbit jumped up and down, "Can we skip this bit?" she asked. "No," said Gunnar sternly, "it's important." Roka really didn't think that it was. The buffalo turned to face towards the washerwoman, and said "Please my lady, continue." The washerwoman didn't seem to notice the buffalo in the slightest. "On the night of the last full moon," she continued, "a powerful vampire came from the dark lands to the north, seeking easy prey. Our greatest soldiers are powerless against his undead wrath. Even my own grandson has fallen to the vampire's unspeakable hunger. I beg you, brave heroes, won't you help me?" "Yes" said Exra, accepting the quest. "Yes" said Roka, accepting the quest. "Aye, poor woman! Rest your troubled heart, for we warriors of goodness will come to thy need!" proclaimed Gunnar. "Come, let us venture forth to slay this foul demon and send it back into the stench-filled pits of the nether! ", and finally also accepted the quest. The washerwoman applauded, clapping her paws in as animated a manner as she had burst into tears only a few seconds before. "My heroes! I am so glad, I will pray for your safety. The vampire has taken residence in the old warlock's tower at the far edge of town. Here, let me mark it on your map for you." A large, friendly-looking blue arrow materialised in the air some distance above the cleric's head. He looked up at it, and then turned to the rabbit woman. "Why does a sleepy farming village have an old warlock's tower?" "They need to put the vampire somewhere" she replied. "Actually," interjected the buffalo, "the tower dates back to the age of the warlord's revolt, in the fourth age of the empire, when the Dreadlord Khundrak rallied his dark forces against the king." Roka sighed, and wished he hasn't asked. Exra stopped jumping up and down for a moment. "You know, if we complete this quest, I calculate that your experience points would be enough for you to level up." A sense of excitement filled the cleric. Hitting the next level would earn him his attack spell, which would mean that he would no longer have to rely on his ‘rusty mace’ to protect himself from the game’s hordes of ogres, vampires and naughty squirrels. More than that, it would mean something even more important. It'd mean that he was a decent healer after all. 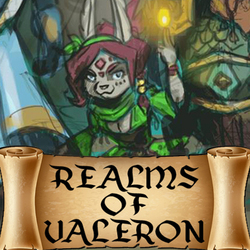 Welcome to the next chapter of "Realms of Valeron". A new chapter twice each week! It was the biggest MMORPG ever created, and took the world by storm. With billions of players from every corner of the planet, 'Realms of Valeron' allowed anybody to interact with one another within the gloriously realized online world. But for Roka, a young healer, it was more than that. It was a gateway to make friends. Friends like Exra, the hyperactive rabbit rogue; Gunnar the loyal dwarf, Sycorax the maniacal warlock, and many more. What adventures lurk within the game? In a world full of quests and dangers, the truest and greatest loot is yet to be discovered. Bound together by the oaths of their guild, they would face brutal trials, savage enemies, and more than a few bugs that the game's play-testers really should have caught before release... But this is no trite story of players trapped inside a video game! Our heroes can turn off the game and leave at any time. But why would they, or any of us, ever want to leave when you have friends like these? Realms of Valeron is a comedy fantasy, part sit-com and part epic adventure, which explores the bonds of friendships in a digital age.